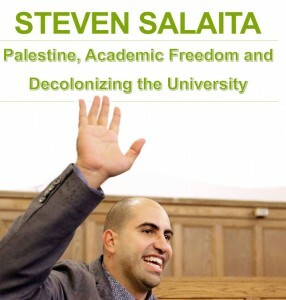 Join us to hear Steven Salaita discuss academic freedom and the struggle to decolonize the university in relation to his own scholarship on indigenous expression. Statements from 19 university presidents in the summer of 2007 to foreclose debate on the academic boycott of Israel, citing “academic freedom”. Visits to Israel by eight university presidents in the summer of 2008, with no equivalent outreach to Palestinian institutions.